Artists are curious by nature when it comes to their chosen profession. When something new and exciting comes along, unless they feel personally threatened by its potential to pull an audience away from them, many will wander by and peer over the fence into the new territory to check it out, perhaps introduce themselves if the inhabitants seem friendly, maybe even give the new settlers a fruit basket and welcome them to the area before hastily returning to the sanctuary of their own more established neighborhood, shaking their head with a bewildered smile while wondering what all the fuss was about. Well it’s like that. Every gawky teenager on their very first date thinks to himself that no guy ever had such a beautiful girlfriend all while he’s blinded by her braces glinting in the sunlight every time she smiles at him. Newlyweds buying their first house feel no one else could possibly grasp how wonderful it is to lay your head down under a roof you actually own. Every new set of parents imagines that no other baby ever cooed such an adorable first word or took such a confident first step as theirs. And just as sure as you’re reading this, each new musical genre making its first public racket is cocksure that theirs will be the one to take over the world. “How silly of them”, the established veteran musicians laugh, “it’ll never catch on. A year from now nobody will remember this crazy rock ‘n’ roll fad”. But a few of the older gentry, mostly those still not quite fully established themselves for one reason or another, at least not to the level of adulation they feel is their birthright, think differently and wonder what opportunities THEY might take advantage of in this new field. After all they surmise, with their experience, their hard-earned knowledge of the ins and outs and ups and downs of the record business, the steely professionalism they had to adopt just to stick with it this long and carve out a living in such an unforgiving climate as the ever-changing music world, well, why wouldn’t they have an advantage over these wet-behind-the-ear newcomers, all youthful enthusiasm with no brutally learned life-lessons behind them to brace them for the harsh wind of rejection or indifference that they’re sure to face. Todd Rhodes had all of that in spades by 1947. Experience, knowledge, professionalism and a closet full of brutal lessons learned from marketplace apathy to much of what he’d been putting down. He was nearly fifty years old by this time, born in 1900 before discs had even replaced cylinders as the dominant form of phonograph recordings. That seniority alone set him apart from those coming along now, as did the fact that Rhodes was a schooled musician with a long list of credits to his name dating back to his time as pianist and arranger for McKinney’s Cotton Pickers, a popular jazz group of the 1920’s. But as vital as he had been to their sound and to their success it still didn’t get him, Todd Rhodes, much acclaim. When he went out on his own in the mid-1930’s he was strictly a local act around Detroit, fairly popular and well-respected in clubs around the region but not nationally known. In the 1940’s he started playing around with a tougher sound, though a bit more high class and sophisticated than what would follow down the line. This time around however he made sure he received the rightful credit, naming the band Todd Rhodes and His Toddlers just so there was no confusion as to who it was you were hearing should it start to catch on. Then he bided his time, but time was running short. In those years while he was able to make a decent living playing music he seemed no closer to making a name for himself that would elevate him to a stature where he needed no introduction and eventually, unless something unexpected happened, he’d have to start to accept that his career was closer to winding down than to taking off. So when this new cacophony calling itself rock music came along it seemed as if it might be just the ticket Todd Rhodes was looking for, offering him one last unlikely shot at glory. The trilling, tinkly piano that opens this gives little indication as to what lays ahead. In fact, based on the opening bars you’ll be forgiven if you reach suddenly for the off button, or if you scramble to make sure you actually have the right track. Ten seconds in, once the light cocktail blues piano gives way, Rhodes the rocker is born. A 47 year old baby if you will. Yet it’s not Rhodes who commands center stage as Blues For The Red Boy settles into its groove, but rather the horns. Louis Barnett on tenor sax, Hal Dismukes on alto and George Favors on baritone, joined by trumpeter Howard Thompson, laying down what can only be described as a sultry, steamy feel. Okay, let’s call it what it is: Stripper music basically, something in the vein of Harlem Nocturne, or a few years around the bend, Night Train. The effect is hypnotic, even without seeing a shapely caramel-skinned beauty disrobing on stage you can surely envision her in your mind as the music puts you in a trance. Rhodes isn’t modestly taking a back seat in the proceedings however, his piano darts in and out tying things together nicely, but he’s just part of the larger ensemble here and as a result it works quite well. Nobody strains to do too much, each is content to carve out their own small piece giving one another plenty of room and thus the overall effect builds up slowly. The clever interlocking riff that forms the basis of the song is exquisite. While the baritone churns underneath to establish the addictive rhythm the other horns ride on top delivering the slightly lurid melody as Rhodes’s piano provides the counterpoint and the cymbals lurk with understated menace off to the side, eyeballing the whole scene. It all comes together as the lead horn takes a solo with a distinctive atmospheric echo to it, almost as if it was set up a bit too far from the microphone in a cavernous room, giving a haunting quality to it all. It’s not a raucous sound for sure, not a hard driving groove even, but it’s absolutely mesmerizing all the same. This is music you might hear from a busy urban street corner emanating from a club on the other side of the tracks – a flashing neon sign buzzing over the door, patrons coming out with a glow on their faces from having a few too many but happy in their lightheadedness before the hangover waylays them the next morning. All around them are the vestiges of sin, tough-looking sharps running a numbers racket… a hep-cat with sleepy eyes off in the corner selling some weed… while up and down the bar sit plenty of well-stacked girls looking for a few bucks or free drinks in exchange for providing some company – or a little bit more – for the single fellas that wander in, pockets full of money and heads full of wild dreams. Nobody’s offended by any of it because in a way every one there is complicit in this nightly pageant of harmless vice, the band included as it’s their job to keep you under their hazy spell so the seedier characters in the shadows can ply their trade more effectively. In that regard Blues For The Red Boy serves its purpose as the perfect backdrop for a thousand and one nocturnal melodramas which play out from dusk ’til dawn each night in the cramped, humid, animated environs rock music took hold in and spread like a dirty rumor. This particular tale was nothing earth-shattering musically, just a very solid, somewhat exotic instrumental – call it rock’s first mood piece – but it established a vivid and memorable scene. This is a really good record, tough and atmospheric, possessing a subtle – almost silky – feel of danger, but even good records, especially from such untested waters as early rock, have a way of disappearing from the public consciousness over time which had to be the assumption one got when this came out. It may catch a few spins on whatever radio program dared to play such things, and maybe enough people would buy it to boost Rhodes’ booking fee a few dollars a night for a couple months, but in the end it’d vanish from memory pretty quickly and Rhodes would be right back where he started from. But that wasn’t the case here, the result of two rather unique postscripts to the story which have kept the record from fading completely into historical oblivion like so many other quality cuts from this time. The first oddity is the fact that Blues For The Red Boy was not a hit on the small Sensation label when released in November 1947 (nothing surprising there, few records WERE hits, especially on such inexperienced labels as that), but a full year later after Rhodes’s contract had been picked up by the larger independent King Records this was re-issued under their aegis and it really caught on, breaking into the top five on the R&B Charts and giving Rhodes his biggest hit in a long and arduous but ultimately successful career. But that’s still not why it’s gotten a slightly longer afterlife than most hit records of its ilk. Though Rhodes’ decision to venture into the nascent rock field was a smart one, giving him a much needed second act for his career, one with a longer afterlife than his sadly forgotten syncopated jazz success in the 20’s, what really put Rhodes’ name in the history books, albeit as merely a footnote in the storied, sensationalistic career of a non-musician, was when Cleveland DJ Alan Freed took Blues For The Red Boy and made it his initial theme music for his radio program, The Moondog House in 1952, effectively renaming the song “Blues For The Moondog”. It was that song, THIS song, over which he’d howl and bay at the moon on the air to open his show each night, then in his own voice tell the pup to “quiet down, or you’ll wake the neighbors”. Theatrical showmanship of the first order. It was Freed of course who would spread the term rock ‘n’ roll nationwide by the mid-fifties, or more accurately, simply introduce the already thriving music to the mainstream white media who would suddenly start to report on the growing popularity of a thrilling and vibrant style that was already many years old and already more than a little popular throughout that entire time to a more segregated audience. Perhaps it’s fitting that, maybe unwittingly, Freed tied it all together in a nice bow by choosing a song from rock’s earliest days made by a musician who predated the whole riotous mess by years, yet who made the conscious and willing decision to seek his fortune by jumping on the rock ‘n’ roll bandwagon before that wagon’s wheels even began rolling in earnest. Both Rhodes and Freed showed faith in the music before most in their respective circles would give it the time of day and for that they both should be remembered and rewarded. 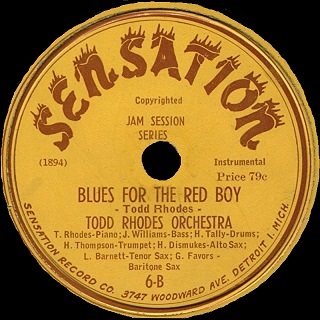 Leave a reply on "Todd Rhodes: “Blues For The Red Boy”"